No shoes. Where’s the purple love? Disappointingly, I must report I am still shoe-less. And let’s face it, that’s just not going to work. I can’t be a barefoot bride. I mean, I am from East Tennessee and all, but seriously, I plan on channeling that side of me when I have a couple of drinks and start drawling my vowels to everyone’s amusement. I don’t need to be barefoot too. It’s all about moderation, people. 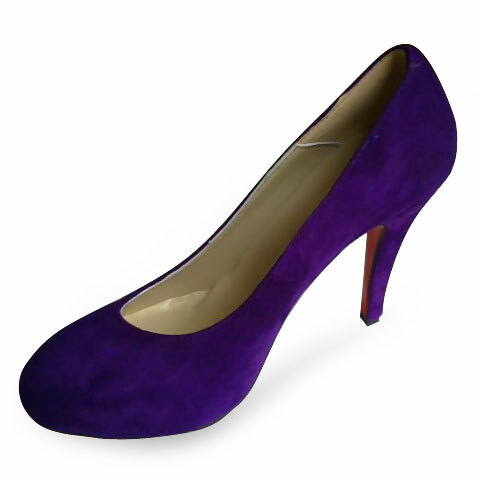 I didn’t realize I was asking a lot when I started searching for a purple heel. I realize white, ivory, silver and gold evening/wedding shoes are going to be way more prevalent than my particular favorite color of the rainbow, but sheesh, no department stores in Wisconsin or Illinois seem to carry pumps in plum or violet or lavender or indigo. So, it looks like I will be ordering these all-important feet candy online and crossing my fingers for the best. It always makes me a little apprehensive to order shoes online, when every pair of shoes fits differently and the perfect fit for me could be anywhere from a 7 to an 8. Thankfully, most companies have fairly decent return policies these days. In case you were curious, these are some of the heeled beauties that have been making my tail wag. If money grew on trees and it were a perfect shoe world, I’d be running around (Ok, maybe more like walking very carefully) in a pair of Christian Louboutin heels like these. I’ve had a love affair for red-soled Louboutins for as long as I can remember. Or maybe some Badgley Mischkas like these. More realistically, I am eyeing shoes like these Ninas. I also dig these RSVPs. And I even love these Me Toos that just have a slight wedge to them. This entry was posted in Uncategorized and tagged shoes, wedding. Bookmark the permalink.